Native Whey Protein Isolate, Natural Flavor, Cocoa Powder Organic, Sea Salt, Lecithin, Reb A (Stevia Extract), Monk Fruit Extract, Lactase. Use as a food supplement only. Do not use for weight reduction. Native Whey Protein Isolate, Natural Flavor, Lecithin, Sea Salt, Reb A (Stevia Extract), Monk Fruit Extract, Lactase. 1. 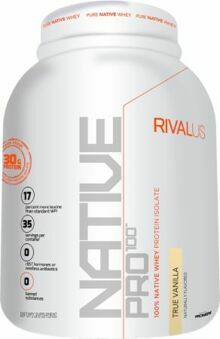 Native WPI is the only added protein source. 2. Native WPI ingredient (dry basis). All amino acids are naturally occurring and approximated. NATIVE PRO 100 contains no‘amino spiking.’ 3. Compared to standard WPI. 4. Native WPI is not a by product of cheese or subjected to secondary pasteurization. 5. No significant difference has been shown between the milk of rBST treated and untreated cows.